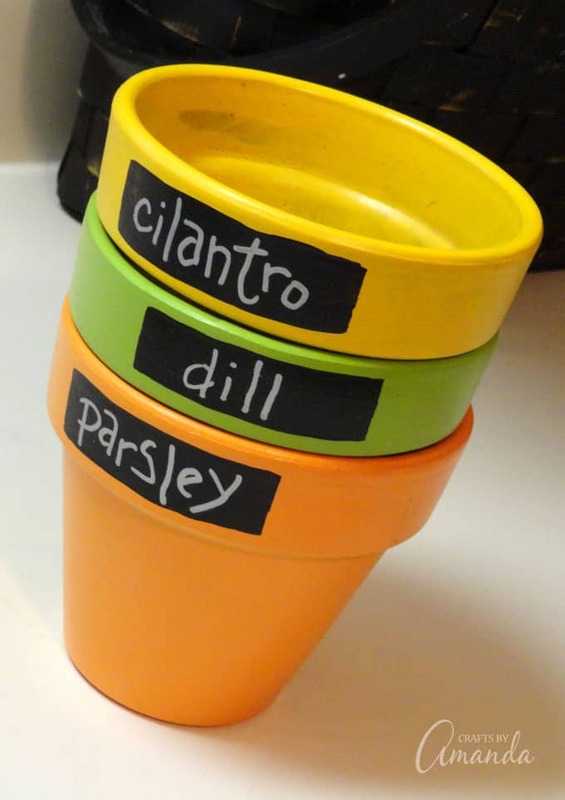 Faux Chalkboard Herb Pots: plant your herbs in these cute terracotta pots! 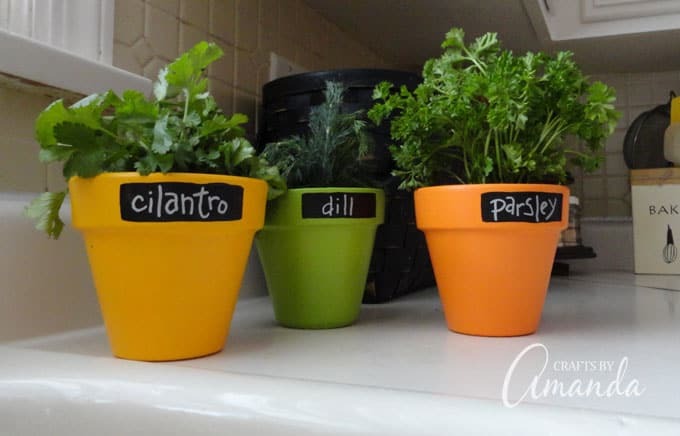 These chalkboard herb pots are a simple project with a bright and cheery outcome! They make great gifts for grandparents, Mother’s Day, Teacher Appreciation Day or just for your own kitchen. 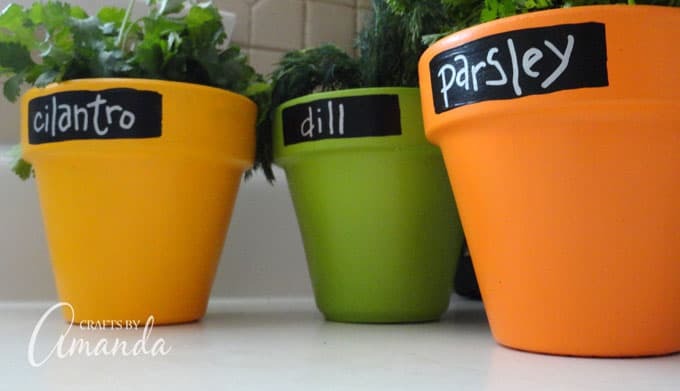 You might be wondering why I would make faux chalkboard herb pots instead of just using chalkboard paint. While you certainly can use chalkboard paint and make yours so you can erase and rewrite, I had to use certain types of paint for this project, and chalkboard wasn’t one of them. However, I love that look, so I came up with something else instead. I made these little chalkboard herb pots for Michael’s craft stores via my designer gig with DecoArt. Michaels carries a line of paint called Craft Smart that DecoArt makes exclusively for the craft supply chain. The Craft Smart paint line includes outdoor paint, similar to DecoArt’s Patio Paint, which I absolutely LOVE. So I used three bright but fairly earthy colors of outdoor paint for the pots and black outdoor paint for the name tags. A simple paint marker is used to write the herb names on the pots. Remember, you can use black chalkboard paint if you prefer and chalk markers to write the names, which can then be wiped off with a damp cloth and rewritten. If you have any extra terracotta pots and are wondering what to do with them next, check out our Terracotta Pot Wind Chimes! This wind chime is a one of a kind and adds character to your garden space. Or for a larger terra cotta pot, try this beautiful Sea Glass Planter. Using sea glass found on the beach you can make your own gorgeous sea glass planter for indoors or outdoors. 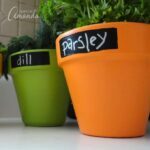 These chalkboard herb pots are a simple project with a bright and cheery outcome! They make great gifts for grandparents, Mother's Day, Teacher Appreciation Day or just for your own kitchen. Paint each terra cotta pot with Craft Smart outdoor paint (Orange, Saffron Yellow, and Citrus Green). Paint a strip of black outdoor paint on the brim of each pot. 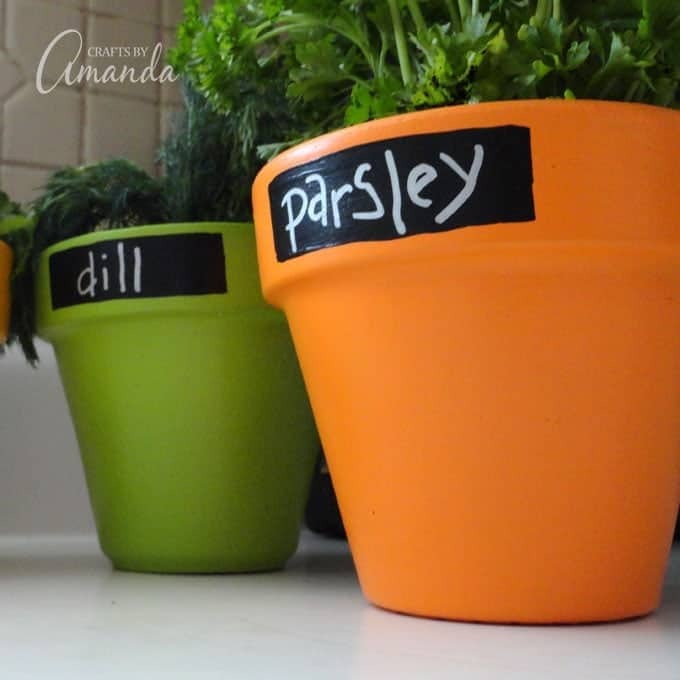 Use a silver paint marker to write the names of herbs on each black strip. Fill the pot with a potted herb. This post was originally published on this blog on March 10, 2012. Many of you ideas are very neat. I am actuallu looking for the tutorial of your paint chips projects. It is outstanding and if you dont mind I would love to make it.They look almost like diamonds. Can you tell me where I can find the directions? Hi Kathy, and thanks for the compliments! The only paint chip project I have though is the paint chip clock which is here https://craftsbyamanda.com/2011/02/paint-chip-clock.html Maybe you are thinking of another medium, or perhaps a different blog? I love these cute pots! I have Orchids and use plastic plant markers with the info for each Orchid. The notes on the plastic plant markers fade quickly – your outdoor paint is the perfect solution! I love the look of these Amanda, so pretty!